Our small two and half acre tree plantation, consisting mostly of 23 year old conifers (Sitka Spruce) and some native trees, Alder and some Ash, was thinned in January 2009. The plantation had never been thinned before. Following our Close-to-nature-Continuous Cover forestry management plan, we marked (see the article link below) and then removed roughly 25% of the trees, about 150 trees. That doesn’t sound that much but were surrounded by piles of logs for months! Our overall and initial aims for our forest are to increase its biodiversity (through natural regeneration) and the resilience of the forest in general. Another side benefit for us, to manage for those objectives, which we achieve by thinning, is that our forest supplies us with a lot of great firewood (in the decades to come in time we might have aged broadleaved trees that will produce higher valued timber as well as the firewood). I did a small film then about how we dealt with some of the logs after the thinning; we employed lightfootforestry.ie to cut the logs with a mobile sawmill and then bagged them into these heavy duty plastic bag pallets (Allen Holman of lightfootforestry.ie has developed this great system that can cut and bag firewood day or night!). We still have a great number of un-sawn logs left too as cutting logs is expensive – we just have them covered until we need the. Even so, we have been unable to get through all the firewood from our first thinning, even though we’ve used loads of it to heat our home (mainly our living room) and sold some pallets of the wood to neighbours, particularly during some of our recent very cold winters. Most people will tell you how poor Sitka Spruce is as a firewood as it burns too fast. It does, but it still gives out a great heat. In time when our forest becomes predominantly composed of Ash trees, we’ll have even better quality firewood, as Ash burns best of all, really slow and hot. 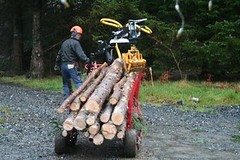 We might even get wood for Hurleys too if we keep selecting for straight clean, Ash trees. In the last few weeks we have got a brand new shed to help dry the wood even better. We are lucky enough to have a 4th generation woodworker/carpenter as a friend who knows our forest well – he helped stack our wood when we were thinning and is interested in our forest management and has planted his own land with trees too. He sourced the lovely dark wood (Douglas fir) wood locally from Wicklow for the shed; it will never need any further treatment and he fashioned two windows out of recycled sweet chestnut and teak. 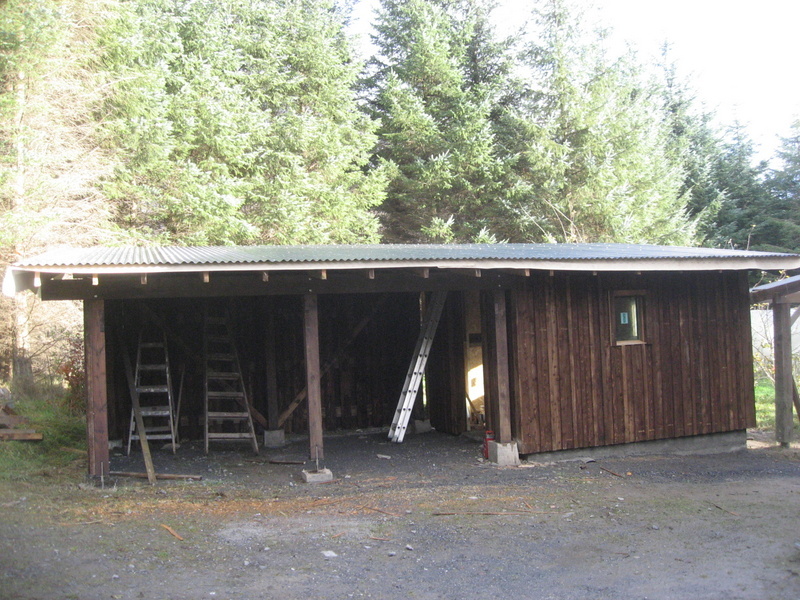 The new shed will house also house a wood gasifier on the right, a more efficient wood burner so we will not be using any heating oil soon – this has long been a dream to become self sufficient from our forest for all our heating. We are now due to thin our forest again. From our two and half acres and our management plan of removing 25% of the trees every three years, we can expect to get 70 tonnes of firewood from our clever forest. Having thinned the forest, we can see our trees, particularly conifers and broadleaves that were too crammed together are shooting ahead even faster, so we might have to deal with even more wood!! An inspiring insight into how easy we can all become more self-sufficient with just a little thought. Next time someone complains about the cost of oil and gas I will have a stern look at the ready.